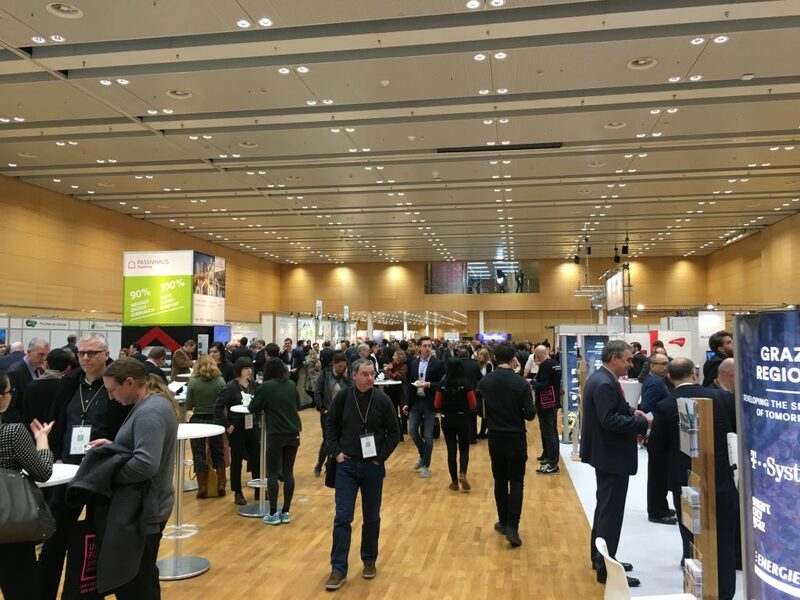 From 28th of February 2018 til the 2nd of March 2018 the Urban Future Global Conference took place in Vienna, Austria. More then 3000 participants from over 400 cities from 50 countries met in Vienna. The conference took place on the first two days. On the last day, the Friday, the attendees used guided trips in Vienna to specific topics, like smart city or architecture. In 57 sessions on topics ranging from climate protection, sustainable building, and mobility, to „making change happen“ and „leadership in cities”, city officials and experts shared personal stories, experiences, and failures with like-minded people. Up to 10 sessions were held parallel, therefore this report will only contain insights about the session LogiMobi attended. Session 1: Autonomous driving will change our cities‘ mobility. But how? In the first Session, titled “Autonomous driving will change our cities mobility. But how?”, a researcher from the Technical University of Vienna presented their project avenue 21. In this project researchers from different faculties work together in an interdisciplinary team to examine the effects of connected and automated mobility and develop scenarios. They developed three scenarios: “Market-driven approach”, “policy-driven approach”, “community-driven approach”. In the last approach, for example, it will be expected that automated vehicles are developed based on open source and are used participatory. More information on Avenue 21 here. The Austrian Institute of Technology (AIT) augmented this discussion by a guide for cities to be ready for automation: Amongst others, policy goals have to be clearly defined with task and roles of the stakeholders. Furthermore, the cities should demand data from private companies which want to offer mobility services in the city. Furthermore, next to the technical focus, cities also have to focus on interaction with the humans. The AIT organize also a conference in Vienna in April called TRA. In the second session, Kris Carter from the City of Boston presented the urban goals of Boston 2030 regarding autonomous vehicles (AVs): Access to Boston’s neighborhoods, Safety to reduce collisions and reliability. Boston is currently testing automated vehicles with the partners nutonomy, optimus ride and aptiv in the harbor of Boston. One challenge was to teach the AVs to detect seagulls. In the beginning, the AV couldn’t detect seagulls and stopped when one of the birds blocked the street. Another lesson learned was to create a flexible testing plane and to publish regular updates of the testing and engage the citizen to build public awareness. The next speaker, Jack Robbins, from FXcollaborative highlighted, for example, the discrepancy between the business models of AV-companies and the commonly known benefits. Car manufactures wants to sell cars, tech companies want to sell advertising and ride startups want to sell rides. 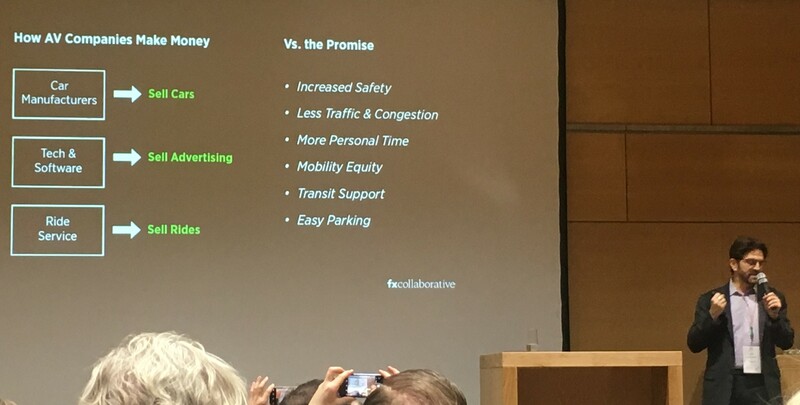 However, the goals like easy parking, mobility equality and less traffic and congestion do not have the highest priority in the business models. Other speakers added that autonomous vehicles are not a solution by itself but need specific goals to improve urban mobility. Regarding the quote of this session “Streets are not for cars, but for humans” the project idea „Public Square“ was shown. „Public square“ is the idea of a modular system which can be placed on side parking spots at streets. Cities are in the rule and decide about public space. They underlined their idea with one example: If New York City shifts only 5% of its street parking spots to other usages, the size of this area would be as big as another central park. However, the speaker explained, there is no market for changing parking spots to green areas, but there is a market to reduce stormwater effects. So currently they slightly redesigned their public spaces to reduce the effects of stormy weather, for example through modules with increased water absorbency. You can see a video of the concept here. In the last session of the first day, the panelists discussed, moderated by Daniel Lyons, EY, about the implementation of zero-emission mobility. Three representatives of cities highlighted the need for zero emissions, regarding CO2 but also noise. The representative of the city of Florence mentioned that Push actions (low emission zones) and Pull actions (better public transport) have to work together to reduce the emissions in the city and convince citizens as well as companies. One speaker summed it up by saying that we (the cities) do not have a problem of understanding the problem, but we do have a lack of fast implementation. After the first congress day, a rich and delicious dinner buffet was served. During the conference breaks of the first and the second day, there was enough time to visit the fairground. On the fair, different cities like Graz and companies like EY were presenting themselves. The second conference day started with a session about the next evolution of urban mobility. Josef Stoll from MHP gave an overview of autonomous vehicles. In the discussion, he made clear that not everybody will change their behavior. Some people still want their own private space in a car and not a public transport facility. Therefore autonomous cars are also needed (next to autonomous busses). Katja Schechtner, an urban scientist at OECD and MIT (senseable city) showed some insights and discussion questions in her current research projects about drones and shared mobility. Only 3% of the current cars are needed if they are shared and used 24 hours. Mrs. Schechtner also highlighted that there is a big variety of solutions for the urban problems. But each city must find its own ideal mix of solutions. It makes no sense to evaluate solutions against each other. For example, drones are only useful to special cases with a light load and only in geographic specific environments ropeways make sense. Sertic Devor from WKO Wien showed some results of the sustainable Logistic 2030+ initiative. All results of a first survey are here: http://www.logistik2030.at. Petra Jens, the commissioner of walking of Vienna showed how Vienna promote people to walk in the city. The goal is that public transport, bike and walk will have 80% of the modal split in 2025. For example they share and still print maps with walking shortcuts through the city as well as maps with public toilets facilities. This had an effect in 2017: More walking trips then car trips were made. More information here: https://www.wienzufuss.at/. In this session also a representative of the biksharing company ofo explained its expansion strategy in Europe. Currently they are in service in 250 cities. She highlights that ofo cooperate with cities and regulation authorities and if necessary will clean the streets and the sidewalks from ofo bikes. A representative of the city of Ghent showed its approach of sharing mobility and highlights „Citizen are more than a cutomer“. This leads to the necessity to inform and engage with the citizen. For example, the city has to explain the citizen what are the goals of the city, why they use their mobility data and to assure that the city protects their data. Olaf Kieser, the CEO of Stadtwerke stuttgart, showed its vespasharing project stella, established in 2011. Regarding a question of the audience the speakers agreed, that station based bikesharing is better, then free-floating bikesharing, because of the inaccuracy of the GPS signal (<30m). This inaccuracy is fine for sharing cars, which are easier to find than bikes (can also be in behind trees and garages etc.). successful and what can be learned from „failing“. Vienna’s Vice-Mayor Maria Vassilakou also drew on a personal summary of the three-year remodelling of one of the longest shopping streets in Europe, Mariahilferstraße. Vassilakou took an open and self-critical look back at the ups and downs in the implementation of the controversial, but ultimately very successful project and addressed specific points which she would approach differently today. Some lessons learned are for example to build a real test track and produce pictures and videos to show the benefits of the project. Furthermore the public should be involved early. In doing so, the UFGC brought this format to the public sector for the first time, thus contributing to a new culture of learning in which mistakes are not only allowed but actually serve as catalysts to foster change to more sustainable cities. One the third day excursions in Vienna took place. LogiMobi visited the U2/U5 Informationcenter which was established to inform the public of Vienna about the new metro line. At the end of the conference, Vice-Mayor Maria Vassilakou handed over the baton for the next conference to Hanna E. Marcussen, Vice-Mayor of Oslo. Norway’s capital was named European Green Capital in 2019 and is therefore predestined to host the next UFGC (from May 22 to 24, 2019). „I am proud that Europe’s largest sustainable cities conference will be coming to my city in 2019. It is inspiring to have so many international experts from whom we can learn in Oslo. I’m already looking forward to many pioneering projects for the future.“ says Marcussen.